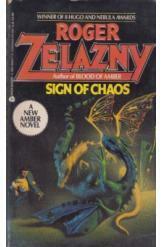 Sign of Chaos by Roger Zelazny, Sci Fi. Book is in good condition, all pages intact. Merlin, the son of Prince Corwin of Amber, travels between the shadow worlds to contend with a conspiracy of magic, technology, and ancient secrets that stretches across the multiverse. Part of the Amber series.